NHL Slapshot was released on September 7, 2010 for the Nintendo Wii with a MSRP of $59.99. $59.99 included the game, NHL Slapshot, as well as the NHL SLAPSHOT Hockey Stick game accessory. The game can be played by 1-4 players, and the description for NHL Slapshot on the Nintendo Channel reads, "Deke, check, and shoot with the all-new NHL SLAPSHOT Hockey Stick game accessory, included with NHL Slapshot. 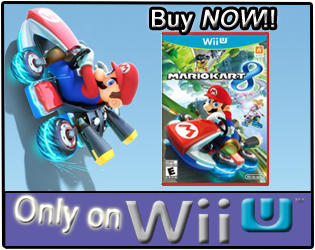 Simply plug the Wii Remote and Nunchuk into the hockey stick and take over any game like a true NHL All-Star." NHL Slapshot was developed by EA Canada and published by EA Sports. The ESRB rating for NHL Slapshot is "E for Everyone", with no Content descriptors listed for parents to be aware of. How many hours have Wii owners spent on the ice with Wayne Gretzky since NHL Slapshot released? Let's take a look! 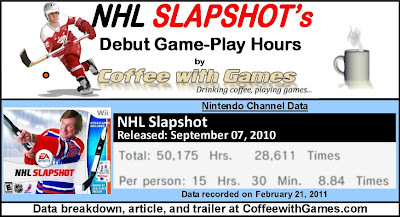 NHL Slapshot has 3,236 Wii owners reporting data through the Nintendo Channel on its debut, with 168 days reported. 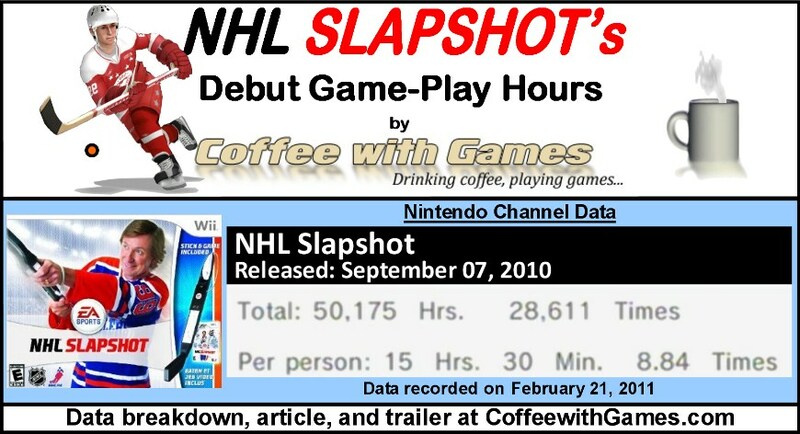 NHL Slapshot has 50,175 Total Hours of game-play reported on its debut, with an average "hockey" time of 15 Hours 30 Minutes "Per Person"(or console) reporting data. NHL Slapshot's average play-time per session is just over 1 Hour 45 Minutes. NHL Slapshot's Amazon.com sale rank is #804, and it is currently selling for $46.99. NHL Slapshot's "professional" review score average is 77.38%, based on 21 reviews on GameRankings.com. NHL Slapshot has a 4.5 out of 5 Stars rating on Amazon.com, based on 41 customer reviews. NHL Slapshot's customer review score average is 90.24%, when converted to a 100% scale. 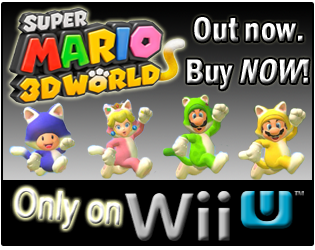 You can click the "41 customer reviews" and read what the customers had to say! I thought it was interesting that NHL Slapshot received and "E" rating from the ESRB, which made me wonder, "Does this hockey game have any fighting?" Well, according to NHL Slapshot's Wikipedia page, it says, "It is the first game in the NHL series since NHL 2005 to receive an E rating, mainly because the game does not include fighting." I remember thinking, "Gimmick!" after seeing the NHL Slapshot Hockey Stick when the game was announced for the Wii. I really didn't think the use of the shell, with the Wii Remote and Nunchuk would work well at all, but after reading several "professional" reviews and many customer reviews, it seems the set-up functions pretty well. I haven't played NHL Slapshot, but I enjoyed hockey games a lot during the last generation of consoles. While 168 days isn't extremely fast for a Wii game to debut, it does make NHL Slapshot the fastest Wii hockey game to debut that was released in 2010. As for NHL Slapshot's price, as I stated in the "Coffee Beans" section the game released with a MSRP of $59.99, but Amazon.com now has the game with a list price of $49.99, and has put it on sale a few times during the last month. So, if you're interested in NHL Slapshot, you may want to watch Amazon.com's prices to see if/when the game goes on sale again if the current asking price of $46.99 isn't your budget for the game. I think seeing the average hours of 15 Hours 30 Minutes "Per person" reporting data, should be encouraging to the developers and show them the Wii owners that are playing it seem to be enjoying it a good amount. I think if the game included online play, the game-play hours would be even higher. So, perhaps if there's a NHL Slapshot 2 in the works, hopefully online multi-player will be included. Have any of you played NHL Slapshot, and if so what did you think about it? Is it a game you would recommend to other Wii owners looking for a fun hockey game, and did the NHL Slapshot Hockey Stick function well from your experience with it?